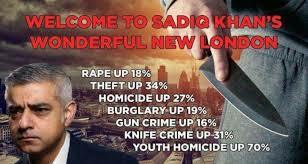 London crime rate – Khan has the answer? The wave of violent crime in London has been making plenty of headlines recently, with murders in the Capital outstripping New York earlier this year. Policing in London is the responsibility of the Mayor and the Mayor’s Office for Policing and Crime (MOPAC) who have issued plenty of soundbites so far but no real plan on how to tackle it. With this in mind, Sadiq Khan’s latest statement on the causes shows just how out of touch with the situation on the ground he has become. Replying to a question on an LBC phone in show, the Mayor stated that ‘Cocaine use at middle class parties’ is driving the gang related violence on the streets, a position previously endorsed by both Simon Kempton of The Police Federation and Justice Secretary David Gauke when he mentioned it back in May. In one way, I can see where the comment has come from – much of the violence is drug related and for the drug gangs to thrive, they need customers. However, cocaine use has not suddenly appeared out of thin air over the last couple of years under Khan’s Mayoralty and has been prevalent in London since at least the 1980’s. Indeed, when The City of London started to forge ahead after deregulation in the 80’s, the ‘yuppy’ culture embraced recreational drug use as part of their ‘work hard, play harder’ culture, not to mention the rise of the illegal raves at the turn of the decade where another drug of choice, Ecstasy, was a central part of the party experience.